Zac Whittle shows good form with bat despite foot injury . A series of mis-judgements ends with 4 dismissals which swing the advantage to Billingshurst. Wisborough’s team at the Tim Monday cup. Pictured from left Charlie Phillps , Joey Calder Smith, Jonny Farmer, Ben Thatcher, Chris Francis, James Sadler . Some nice words at the closing presentation from Jonny ‘ Big Will ‘ Farmer who reflected on the fun side that Tim brought to the game and our club. We look forward to a slightly better performance on the field at the tournament next year which will be hosted at Aldershot. 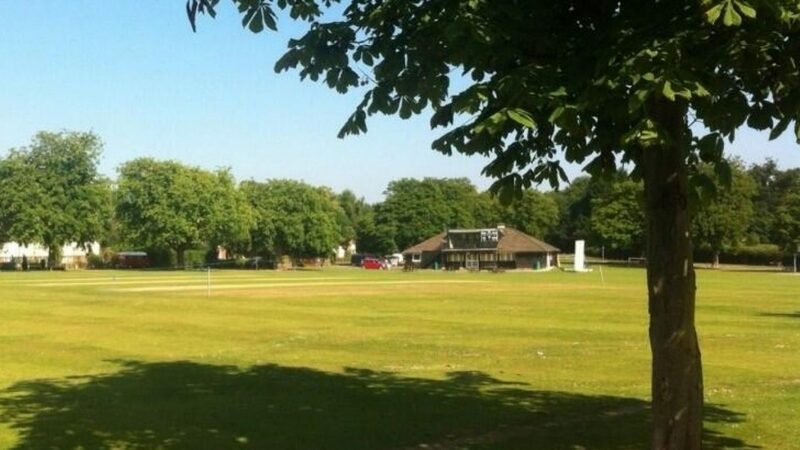 Many of you will be unaware, but running a cricket club is an expensive business. The basic running costs are about £15,000 – £18,000 a year. Each season, the club therefore needs to raise significant funds beyond membership and match fees and we are grateful to our sponsors, the Century Club and other fundraising efforts to ensure that cricket is as affordable as possible for as many as possible. On top of this there are also other one off expenses. Over the last four or so years fundraising has meant that we have been able to invest in the nets (£17,000), a new square mower (over £5,000) and a new roller (£7,000 with the cost shared with the football club). Knight Frank, a main sponsor have made a very generous offer to support this fund raising. If you are looking to sell your house please could you consider Knight Frank? They are happy to donate up to £1000 of any fee to the cricket club if the sale is successful. 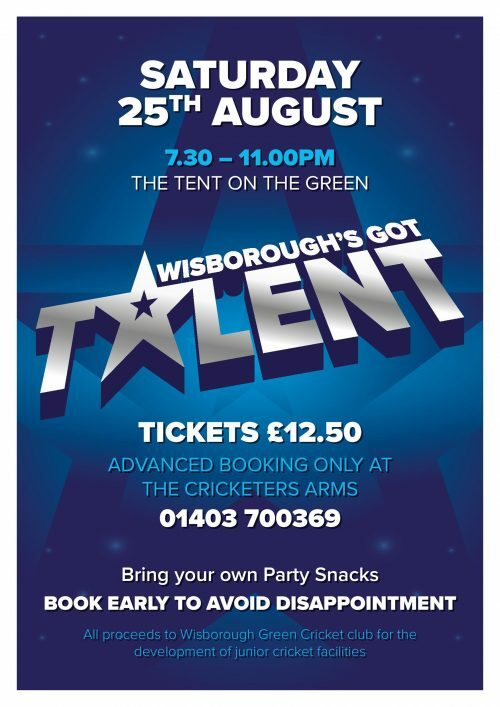 The Cricketers Arms, has sponsored the cricket club for many years and has been the driving force behind Wisborough’s Got talent. This year Craig has selected the Cricket Club as the beneficiary of funds raised on the evening. 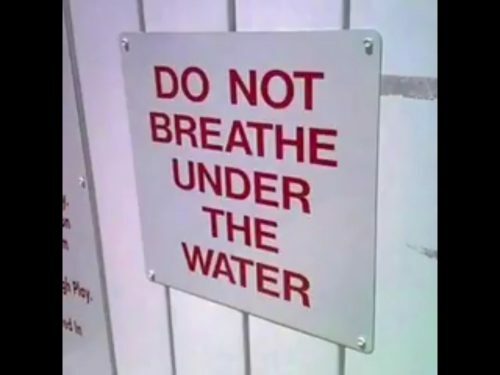 See details below . Please book your places now!! It would be great to see a couple of acts from the cricket club, I know the seniors are hatching a plan. Please contact Craig and let Stev Calder Smith know if you are planning something. It would be lovely to see a junior parent’s act or a Vice Presidents act. 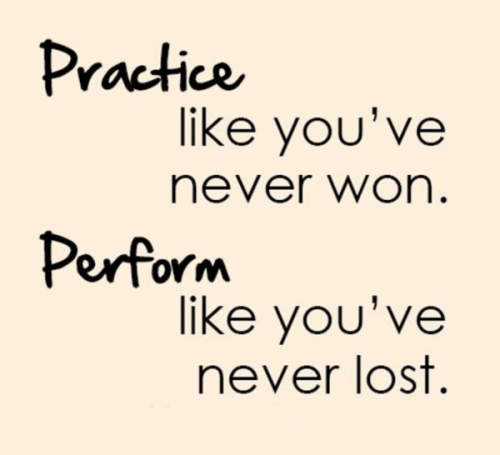 We know there is plenty of talent around !! Put this in your diary now. Our major fund raiser will be on the 24th August when a race night is planned to take place. 6 races in all be on the card with an opportunity to win on each. Between the races there will be a meal, an auction and comedy. 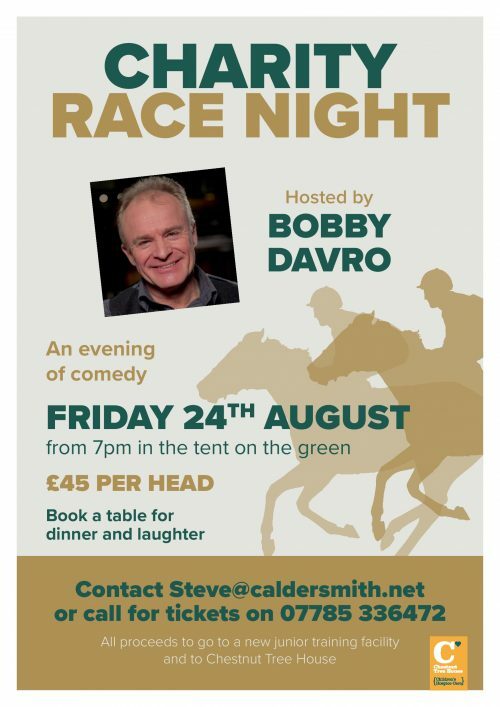 The star of the show will be Bobby Davro and he will host and compere the evening as well as introducing the race card and coordinating all the activities that will take place in the big marquee on the green. 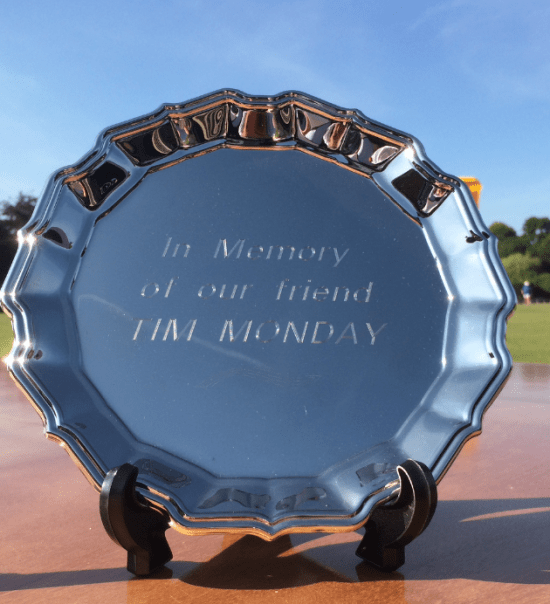 Presidents Day : Presidents Day is on 15 July which also happens to be the Words Cup football final. 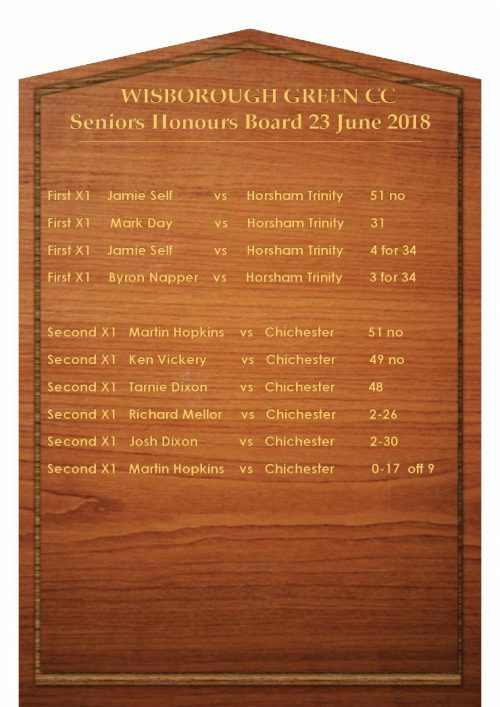 The programme for the day is Twenty- twenty cricket starting at 11:30 and finishing by 3pm in time for the football final. More details to follow next week. As everyone knows a huge amount of effort has gone into refurbishing the Pav. We have a great summer ahead of us with plenty of sport on offer and we look forward to continuing to enjoy our new facilities with the high standards of behaviour expected by all. Staff serving at the bar have been tasked with keeping a close watch on behaviour and we are sure that everyone will support them to ensure that everyone enjoys the atmosphere in the right way. The management committee of the Pav have also informed us they will no longer be accepting tabs and those with outstanding tabs will not be served until the outstanding tabs are paid. The First XI visited Victory Road on Saturday, seeking inspiration from the name to gain a first win in a month, Horsham Trinity the hosts. Skipper Jim Sadler won the toss and elected to bat first on what looked like it would be a good surface for batting but, although pacier than most so far this season, proved a little tougher than anticipated. The dominant feature of the early stages was some fine bowling from Louie Donnelly, who showed an ability to move the ball both ways. First he dismissed Byron Napper, smartly caught behind by Elliott Stanbridge, diving to his right, with the final ball of his second over. Jack Sizzey-Carter, promoted from 11 to 2 in the order, did not look at ease against the new ball. Although he found the boundary twice, he played and missed against Joe Cox on a number of occasions, before being bowled by Donnelly. Jordan Bell, having been consistently troubled by Donnelly in an uncomfortable half an hour at the crease, was then bowled by a yorker. 32 for 3 off 12 overs, Donnelly 3 for 10. He was to bowl his 15 overs unchanged, finishing with 3 for 37. Alan Law, making his debut for the club, not surprisingly initially looked a little rusty in his first game of cricket for five years. Having looked to be settling in, he was l.b.w. for 9 to a ball of full length from Dan Skett, who proved to be a consistently threatening presence in a 15-over spell yielding 2 for 43. Mark Day looked in good nick, solid in defence and playing a number of sweetly-timed strokes, including several through extra-cover. Although dropped at slip off Skett, prompting a shout of frustration from the bowler possibly heard by most of Horsham, he rarely looked in trouble otherwise. However, having moved to 31, he was run out, calling for a very tight single having pushed to cover. Sent back by his skipper, after a momentary hesitation, Mark was well short of his ground. 63 for 5. The experienced pairing of Jim Sadler and Tim Dodd both made convincing starts, getting to 12 and 20 respectively, before falling to straightforward catches from loose strokes, the former caught at gully having started to play a pull to a ball that proved too wide of off stump to do so, the latter lobbing a gentle catch to cover, after attempting a back foot forcing stroke against left-arm spinner Darren McDonald. At 112 for 7 in the 36th over, we certainly looked in danger of being dismissed, for a fairly modest total, well within our 49 overs. Jamie Self (on 1) was dropped at slip, a tough chance, but soon drove McDonald for a straight six. However, with the total 131, the last ball of the same over provided a moment that was to cause much discussion during the rest of the match. Going back to late cut McDonald, Jamie’s edge to ‘keeper Stanbridge was audible to almost everyone in the ground, but crucially not to the umpire at the bowler’s end and, standing his ground, Jamie survived. To say that the majority of the Trinity team were apoplectic in response would be an under-statement. Whilst I could understand their annoyance, it was disappointing to hear numerous uses of the word “cheat” in the remainder of our innings and, apparently, even at the end of the match. The home side’s sense of injustice was heightened by Jamie reaching a fluent 51 not out, many runs being scored to third man, the short straight boundaries much to Jamie’s liking, and a second six, over mid-off, being struck in the latter stages. Jamie received good support from Stuart Rainford (7 of a stand of 43) and D.J. Dominique (8 not out of an unbroken stand of 26). We finished with a considerably higher total than had seemed likely for most of the afternoon, 181 for 8. 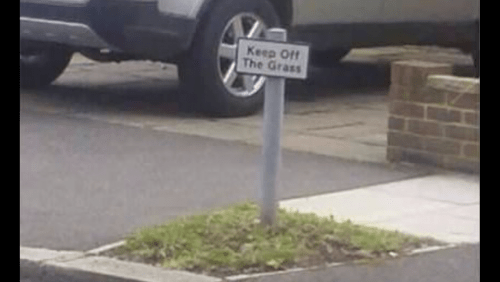 Early in the home reply, amusement was caused by a pungent aroma, leading Jonny Farmer to remark, when asked to move his position in the field, that he was “getting high”. The same group of youths this was emanating from then proceeded to recite a number of lyrics to the rap blaring out of their stereo, best not repeated here. On the pitch, Louie Donnelly began the home reply positively, moving serenely to 18 inside the first 5 overs. However, having driven Byron Napper for boundaries through mid-off and extra-cover earlier in the over, he then pulled him low to Jamie Self at mid-wicket who, typically, made a potentially tricky chance look relatively straightforward. In his first bowl of the season, Byron performed admirably, claiming a second wicket in his nine-over spell, Kimberley bowled after leaving a ball that apparently pitched around the line of off stump. In between these two dismissals, having earlier seen him dropped by D.J. seconds after the latter had encouraged him with an assertion of “a nick is coming”, Jamie hit the off stump of Standbridge, with a ball that kept slightly low. Jamie claimed three more victims in quick succession later in his spell, as Trinity fell from 56 for 3 to 63 for 6, Skett caught by Jonny Farmer after miscuing a full toss to mid-on, Bushby smartly caught by Stuart at extra-cover and Robinson l.b.w. missing an attempted pull, the ball keeping lower than anticipated. For the second week in succession, Jamie had a four-wicket haul, his final figures 4 for 34 from 15 overs. After his unfortunate injury near the start of last week’s match, Jamie has produced two very fine all-round displays. With only four wickets intact and more than 23 overs still remaining, a quiet passage of play ensued. 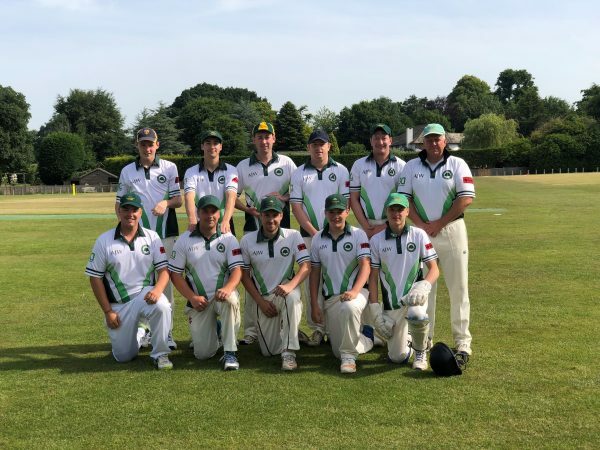 However, Trinity skipper Ben Chappels, who had come in at Number 3, found a useful ally in the younger of the Donnelly brothers, Leon and, having played with great caution earlier (taking 15 overs to reach double figures) he accelerated. Scoring predominantly along the ground on the leg-side, he had moved to 42, before being dismissed in the most unfortunate manner possible; Jonny was unable to hold a tricky caught-and-bowled chance from Donnelly, but the ball deflected off his fingers onto the stumps, with Chappels just out of his ground. It had seemed that, although it was a tall order, Chappels was possibly still attempting to force a victory but, with his dismissal making the total 114 for 7 with 9 overs left, only two possible outcomes now remained. We were unable to force a victory thanks to some stubborn resistance from the Trinity tail. Two more wickets fell, Tavener lobbing Jack Sizzey-Carter gently to Jonny at backward point and a returning Byron (who finished with 3 for 34) softening up McDonald with a short ball before bowling him. We were left with two overs in which to claim the final wicket, but Donnelly (24 not out) and Cox survived with few alarms. Trinity closed on 130 for 9. So, a third draw in the last four matches. We have become something of the draw specialists in the league, nobody else having drawn more than twice. This was a consistent display from our four-man attack, with just not quite enough penetration to force victory. Overall we were the better side, although two key moments, one in each innings, certainly went in our favour. Interestingly, in six of our seven matches so far, we have bowled fewer wides than the opposition, a measure of the accuracy of our bowling, and this could be a key factor in the 40-over matches which begin after this weekend. In the meantime, we play hosts to bottom side Eastergate with what looks to be a strong line-up. Another lovely day was the setting for Wisborough Green’s Under 10’s who took on the unbeaten league leaders, Horsham Trinity CC, at home. Our captain for the game, Flynn, won the toss and sent Horsham Trinity CC into bat. The Wisborough Green Colts bowled and fielded exceptionally well. Well done to Zac, our leading wicket taker with 3 wickets off his allocated overs. Some great performances in the field with a fine run out from a direct throw by Georgina and runs saved with determined fielding and backing up by the rest of the team. At the end of their allocated overs, Horsham Trinity had lost 9 wickets and Wisborough Green restricted the visitors to a total of 240 runs. Wisborough Green then began the run chase. A very good start was made by Joseph and Charlie with some lovely boundaries being scored and they put on a 36 run partnership. Georgina and William Green were next to the crease and also did a very good job against a strong bowling attack, Rufus and Miles then followed and batted very well adding a valuable 16 runs taking the total past Horsham Trinity’s to 253. Alex and Zac extended the lead played some very nice shots with a partnership of 27. William Reed and Flynn were our final pair and they also did a great job with the bat extending our total to 288. Congratulations to our leading run scorer, Joseph Reed. The final scores were Wisborough Green CC 288 vs Horsham Trinity CC 240. An excellent team performance by the Colts who all contributed to the win against the league leaders.